For best results strap cocktail shaker to penny farthing wheel and traverse cobbles. 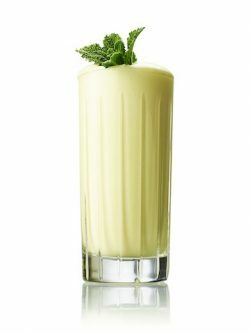 If this is impossible or you live in a historically unsympathetic area, then this is the slightly easier option – combine ingredients in cocktail shaker without soda water. Add ice and shake vigorously for a number of minutes. After three minutes, pour into glass without ice and add a splash of soda water. One should be able to stand a straw up vertically in the frothy concoction.